I can craft it (Dadampa - aliance - doomhammer). Just dropped for us in Shattered Halls, off the ogre boss. There are a lot of rumors going around that you need a smith in the group for it to drop, but I can tell you they are false. The skill itself come 2.1 will now give you the same plans, but the associated costs have been SUBSTANTIALLY increased. You will now need 10 Khorium Bars and 4 MORE Primal Nethers. It's one thing to make these items harder to acquire due to the fact that their quality matches if not exceeds many epic items... but the expenditures added onto this are just a bit absurd. This change will cause a tremendous degree of difficulty to craft, let alone sell these items for the cost of crafting it. Am I the only one reading the Nethers as unchanged? On the updated info above, 10x Khorium, 10x Felsteel, 6x Primal Might and 2x Primal Nether = Same number of Nethers, 2 less Mights, 10 more Khorium. Not a massive change, if the tooltip pictured for this item is correct. To be honest, it's actually easier to do after 2.1 because you need to farm less Primals for the Mights. It is correct that you do NOT have to have a Blacksmith in your party in order for this pattern to drop. dropped off a sunfury demon hunter initiate non-elite on the blood elven terrace at the black temple for me. So is this a world drop or are there any places that seem to drop it more often than others? Some alliance were killing the bird people out in Blades Edge Mountains so I decided to move on to the next part of my quest. First bird I killed, dropped these. O.o. I was stunned. Gonna go see how much I can sell them for. I just had one drop off a Wretched Fiend (http://www.wowhead.com/?npc=24966) on the Isle. It just dropped for me by one of the Wailing Spectre's underneath Karazhan. And put it on AH for 1000g, got sold pretty quick. Dropped in Kara today, so it's really totally random from high level mobs. 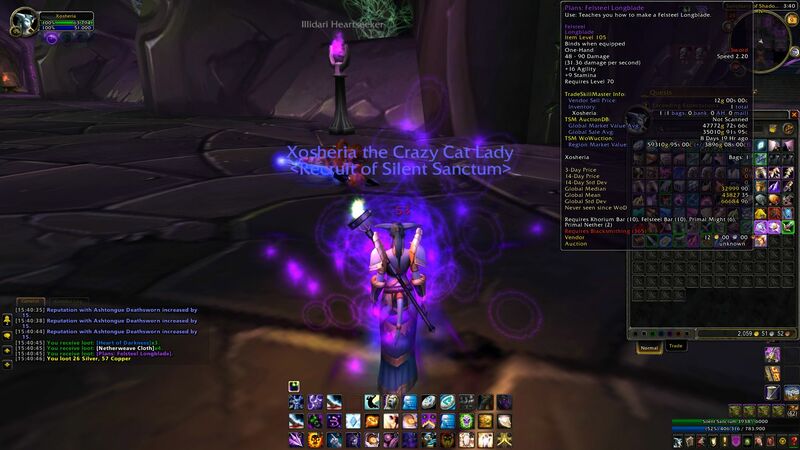 This dropped for my priest today from a Shaleskin Flayer. It's not in it's loot table on WoWHead, however not everything is documented even though it seems like it all is. With the upcoming Transmogrification system in 4.3, these plans and the swords they make are going to be worth quite a bit more once the patch hits. Prices for the plans have skyrocketed on many servers and I imagine people who have learned these plans are going to make some pretty decent gold. Some guy just said "someone just offered me 10k for it" clearly lying being greedy, i offered a reasonable 5k for them and he still wouldnt accept regaurdless of that he wont find anyone besides me willing to buy it for a high amount of gold. My server is extremely poor. Oh well, i will not over spend on it, back to farming. I've been running Outland heroics and raids since I could solo them, and I've never seen these plans drop. On my server, there was only one person with his pattern. So yes, it's a pretty rare sight. I saw it a few days ago on the AH, though, and snagged it for the 15K buyout. So happy :) The sword looks very good. WHY THE DOWNVOTE? There aren't many that can craft this item. In the picture does it seem like he's dual wielding the swords but has a fist weapon in his left hand? Avian Ripper Apparently no longer drop these as they are not in the list of things they drop. These dropped while I was farming netherwing rep, don't remember what mob they were from but the sold on AH for 19k gold. I obtained one off of an Felslandschinder. so guys i was wondering im trying to get my hands on it and buying is not an option at least for now. i don't mind farming it so i wanted to ask. if i go to sunwell and spam reset every hour (10 instances resets maximum/per hour right now) and kill the trash mobs with the arch mage that supposedly "drops" the recipe is it a good way to farm it? i've tried it a couple of times and it takes my like 3 mins to clear trash get out and reset. also its a nice way to farm gold too. in addition do you have another way to propose for farming it instead? Just dropped from a Sister of Pain in BT while solo and not a blacksmith. I'm on Drenden Alliance. I will be leveling blacksmith on an alt to learn this pattern. I should be crafting these in a week from now. I have had this on my blacksmith since the day I stepped into outlands. When it dropped I had no idea it was that valuable. I was on my blacksmith Brownsugar-blackhand so I learned it and went on my merry way. I've only made a few do to guildie seeing it in the guild profession search and hitting me up to make one. I probably won't farm the mats being too busy but if someone wants one made on Blackhand whisper me in game and give me the mats and I will do it. Dropped today for my wife, who was farming Räuber der Zaxxis for rep. Dropped on Nesingwary-US in an area called "The Heap" south of Area 51. I saw this and thought this is my next project for some farming. Screenshot is my frost DK with her cool new blades. Just had this drop in normal Magisters' Terrace, from mobs in the room with Kael'thas Sunstrider. Any one know a good way to farm this? Just bought one for 300 gold at the ah. What the actual %^&*. This and felsteel reaper both dropped at the same time from a group of mobs in botanical while I was farming battle cast pants recipe. This and felsteel reaper both dropped at the same time from a group of mobs in botanica while I was farming battle cast pants recipe. Will this drop for anyone? Or do you have to be a blacksmith? Is the plans bind on pickup? Dropped from a random mob in Hellfire Ramparts normal, is this thing still selling? Dropped in Mana Tombs today for me and I happened to have been streaming at the time, so I've got video for those skeptical players out there. According to the 'unlearned' section of the in-game profession window, this among other recipes can be looted from Truhe der Echsennarbes in Shadowmoon Valley. It dropped today for me in Karazhan from the Skeletal guards from the Opera hall. Confirmed drop in 8.0 from Tempest Keep trash mobs while farming the Bop leatherworking recipes. Benutzen: Lehrt Euch die Herstellung eines Teufelsstahllangschwerts.